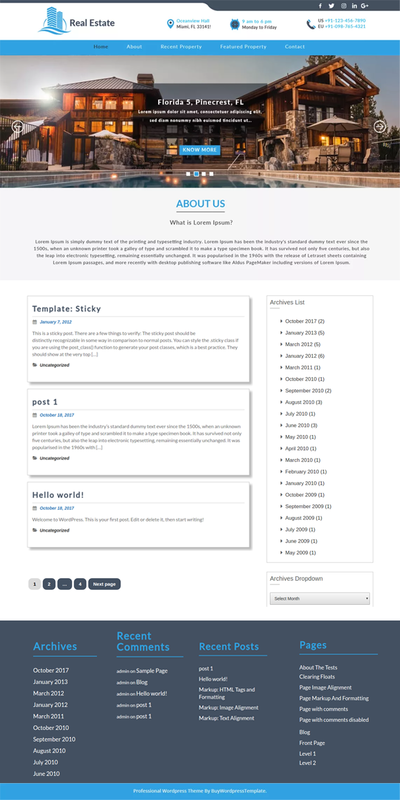 This is a free real estate WordPress theme suitable for small, medium and large scale business. This free real estate WordPress theme is totally minimal and has no charge behind it at all. Anyone that aspires to kickstart their estate business of marketing and sales can do so with us. The theme is intuitive and has smooth retina ready design. The users will have a nice time on your webpage with our theme, the formatting is simple, as it is well defined with an awesome inner and outer page layouts. The main objective of this theme is to enable users to set up their web pages without a fuss. Not any ordinary theme can do the trick and prove to be beneficial for your construction website. So we came up with our free WordPress theme for construction businesses. We have made it with a singular business in perspective of construction & real estate. So you can breathe easy and relive yourself from stressing about how would it look. Since the design is made specifically for one segment of users. This minimal property template has some useful features that make it an utopian choice as it has an upgraded version of itself known as: Premium real estate WordPress theme. The minimal theme comes with features like beautiful inner page layout, retina ready design, responsiveness, an intuitive template with cross-browser compatibility. The premium version of this theme beats this minimal version umpteen times into dust, as it is far superior. The premium version will grant a lot many things that are hard to find on the online theme market but we provide them because satisfying our customers takes priority and we are not the firm that will ever compromise with it.